Snooper 3ZERO GPS, Radar and Laser based speed camera detector provides advanced warnings to both fixed and mobile speed camera locations. GPS updates are fed via the AURA database as a download from your PC, while built-in detection provides live alerts to both radar and laser based systems. The 3ZERO is designed to be windscreen or dash mounted (both options are in the box) and a bright LED display and tone/voice alert provides all the warnings. Subscription charges apply, they are £2.99 a month, £7.99 a quarter or £29.99 a year. The Snooper 3ZERO also includes a black carrying case, the perfect place to store the 3ZERO when you're not using it. Snooper 3ZERO has been discontinued. The replacement model is the Snooper 4ZERO Elite BT. Accessories are still available for your Snooper 3ZERO click here. Snooper 3ZERO speed camera detector includes not one, not two, but three different types of techonology for detection to provide advanced warnings to the UK's speed cameras. The Snooper 3ZERO includes GPS, Radar and Laser detection, the ONLY standalone system we sell to include all three! ‣GPS database - features fixed and mobile cameras, some fixed cameras like Truvelo and SPECS are undectable via a radar or laser detector - this is when your really need a database! ‣Radar detector - detects mobile 'in use' radar based guns and all live Gatso cameras. ‣Laser detector - detects mobile 'in use' laser based gun. These are the more commonly used mobile cameras that are used by the Police and Safety Camera Partnerships. Released in 2009 to celebrate Snooper's 30th anniversary, the 3ZERO has become one of our best selling speed camera detectors as it is the ONLY standalone system we sell that includes all three technologies! When you are within the selected range (100-1000metres) of the location of a speed camera via the GPS database, the Snooper 3ZERO's green on black dot matrix screen advises you of the type of camera you're approaching i.e. 'Gatso', confirms the speed limit and then counts you down in increments of 50metres to the exact location. This is indicated by both the 3ZERO's screen and also via spoken voice alerts, allowing you to hear the information without the need to take your eyes off the road. The Snooper 3ZERO features a pre-alert setting which enables you to adjust the distance that the 3 Zero will alert from to a fixed speed camera when utilising GPS. You can set your own personal pre-alert distance in 50 metre increments from 100 metres to a maximum of 1000 metres or alternatively you can select the 'Auto-Range'. When you are within the range (up to 1 mile) of a live 'in use' radar or laser based system, the 3ZERO's screen confirms what is being detected i.e. 'K' band for a radar based system, the unit then also sounds an intermittent beep. The radar detector covers the following bands: X, K, Ka, and Ku. The Snooper 3ZERO, like all Snooper speed camera detectors, gets the GPS speed camera data from the Snooper AURA speed camera database - subscription fees and connection to your Windows based PC apply. The database provides advanced warnings to known fixed and mobile speed camera locations across the UK, Europe and in a growing number of other countries across the world. Do you have a question about the Snooper 3ZERO that's not been answered on this webpage? Please see our speed camera detector FAQs for questions from other customers and visitors. Plus if the answer to your question isn't featured, use the online form to ask us for the answer. Alternatively please telephone 01733 777623 Monday to Friday (9:30am-5:00pm) to speak to one of our sales team. Snooper 3ZERO can be installed in seconds and can be moved easily from vehicle to vehicle. Simply mount the Snooper 3ZERO on the dashboard or the on the windscreen with the mounting brackets provided. Power it from the cigarette lighter socket, switch it on and you're ready to go! The 3Zero can also be installed on a motorbike. An earpiece/headphone socket is included on the side of the Snooper 3ZERO device so that audible alerts can be heard. Please note: The 3 Zero is not waterproof, when mounting/using on a motorbike we recommend that you mount with a tank bag. More information about installing the 3ZERO on a motorbike can be found on page 21 of the manual. There are 3 easy ways to pay by Futurepay automatic payment system by credit or debit card. All payment packages provide unlimited access to the AURA database. Minimum subscription period 12 months. Please note: It is also possible to use the Snooper 3ZERO as radar and laser detector only, without paying for the Snooper AURA GPS database. IMPORTANT: It is fully legal to use, own and operate a speed camera detector in the UK. However, before using the Snooper 3ZERO outside of the United Kingdom we STRONGLY RECOMMEND that you check to ensure that the use of a speed camera detector in other countries is also legal. The Snooper 3Zero will only operate on Windows computers. Specifically, you must be using Windows XP, Windows Vista, Windows 2000, Windows 7, Windows 8 / 8.1, Windows 10. Additionally the software will only work with Internet Explorer 8 or Firefox 10 or above. 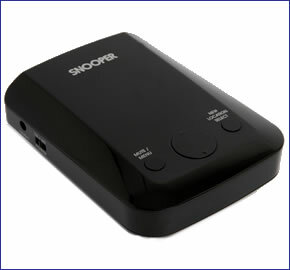 The Snooper 3Zero will not operate when using Windows 95, 98, 98SE, Millennium or Apple Macintosh operating systems. Want to buy additional accessories for the Snooper 3ZERO? View all of the genuine Snooper 3ZERO parts and accessories. Question: I purchased a usb lead from you for my Snooper 3zero. However when I tried connecting it to my device it didn't work. Can you give me a returns reference please so I can return it? Answer: We are assuming that you are advising that it is the cable that did not work, rather than the 3Zero? As you can see, the mini USB cable is Snooper branded. This was from new stock recently received from Performance Products in Runcorn (Snooper manufacturer). It should therefore be guaranteed to be compatible with the Snooper 3Zero. In 12+ years of trading we have never known a Snooper USB cable to be faulty. We presume that you would probably still wish to update your 3Zero? Snooper advise that you must connect the cable to a USB 2 port on your PC. This port is coloured 'black'. A USB 3 port, coloured Blue, will not connect. No Snooper product is Apple MAC compatible, so you must connect to a Windows PC. If you connect to a MAC the cable will not work with the 3Zero. A subscription is required for the 3Zero. If your subscription has expired that may explain why the cable failed to download any data. Do you have a question about the Snooper 3ZERO? Submit your question via our contact page. Please note: Page 20 of the PDF manual refers to three different Logic Modes. Logic Modes are NO longer available following a firmware update on the 3ZERO. Read more about the change here. The same advice about vehicle glass applies to radar and laser signals.